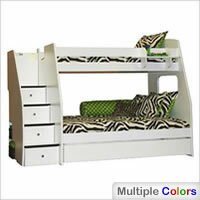 Weight capacity for top bunk: 150 lbs. Atlantic Furniture's Columbia Twin/Full bunk bed is one of the most popular bunk beds on the market today, and with good reason. The pleasant missionary style design combined with the sturdy build -- over two dozen steel reinforcement points should testify to that -- and a reasonable price, make for a very attractive overall package. 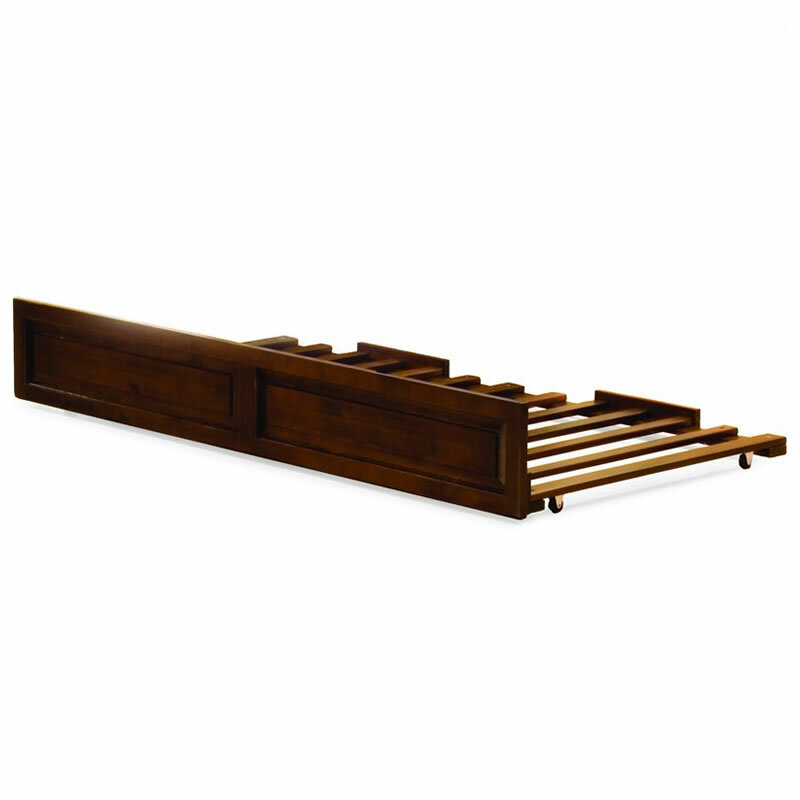 And let's not forget its versatility; the bed comes in four different finishes and will fit into pretty much any kind of environment. 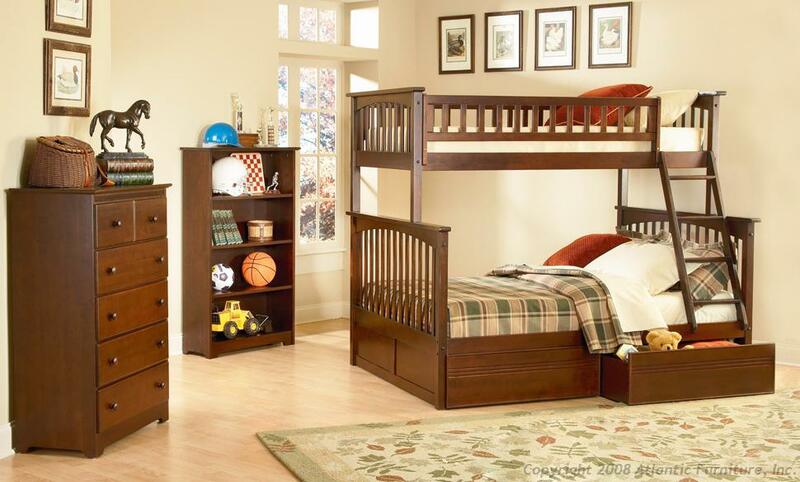 For an added functionality, the Columbia line of wooden bunk beds can be supplemented with under bed storage drawers or a trundle bed, plus an entire room of matching furniture. 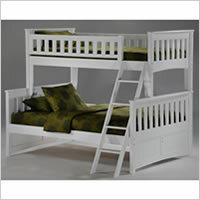 Furthermore, the top bunk can be easily removed and the standard configuration split into two separate beds. Buyers who took the time to post their opinion on this product online most often describe it as: durable, comfortable, attractively designed, practical. They also agree on the bed's sturdiness and ease of assembly. 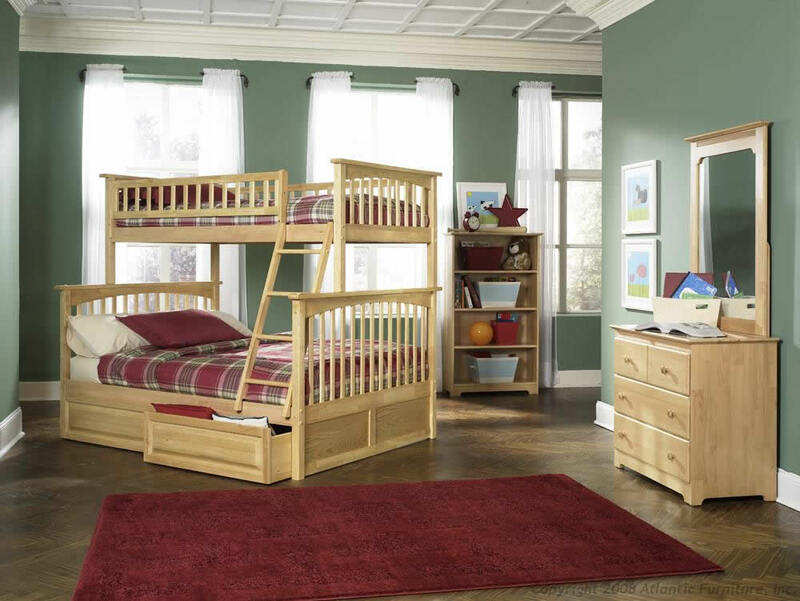 Durability -- sturdiness, quality of build, these are things that the bulk of the reviewers allege as the bed's primary quality. Quite a few does so somewhat in surprise, admitting freely that they hadn't expected this level of craftsmanship for the price they'd paid. The bed is reported to take heavy abuse from energetic nine-year-olds, and will also comfortably accommodate parents who want to snuggle in with their kids for a bedtime story. Without squeaking, swaying, or movement of any kind. Attractive design -- something you can check out yourself by clicking on one of the thumbnails to the right. Not really the same as experiencing the bed in person, granted, but it will give you a general idea of the elegant stylishness of the missionary design. Couple that with the often mentioned beautiful paint, elegant and sophisticated finish, and you'll get a better vision of the whole picture. Ease of assembly -- the product will arrive in six or more flat boxes (depends on whether or not you order any optional items and/or matching furniture), which can be a little intimidating at first. However, since "easy to assemble" is one of the most often repeated phrases associated with this product, there is probably no concern necessary. 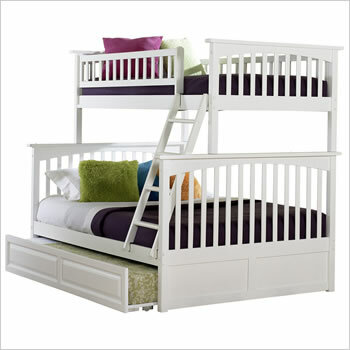 In fact, the majority of buyers reportedly managed to put the bunkbed together in a few hours, often less. There are some mixed feelings about the enclosed directions though; while most people find them easy to follow, a few differing opinions out there suggest they can be rather confusing and that throwing them away and following common sense instead is a better way to go. One more thing regarding the assembly: it is advised that you put together the top bunk prior to sitting it on top of the lower one -- this seems like a natural thing to do, however, we mention it here as we've stumbled upon this piece of advice more than once, so perhaps there is some catch there we're not aware of. 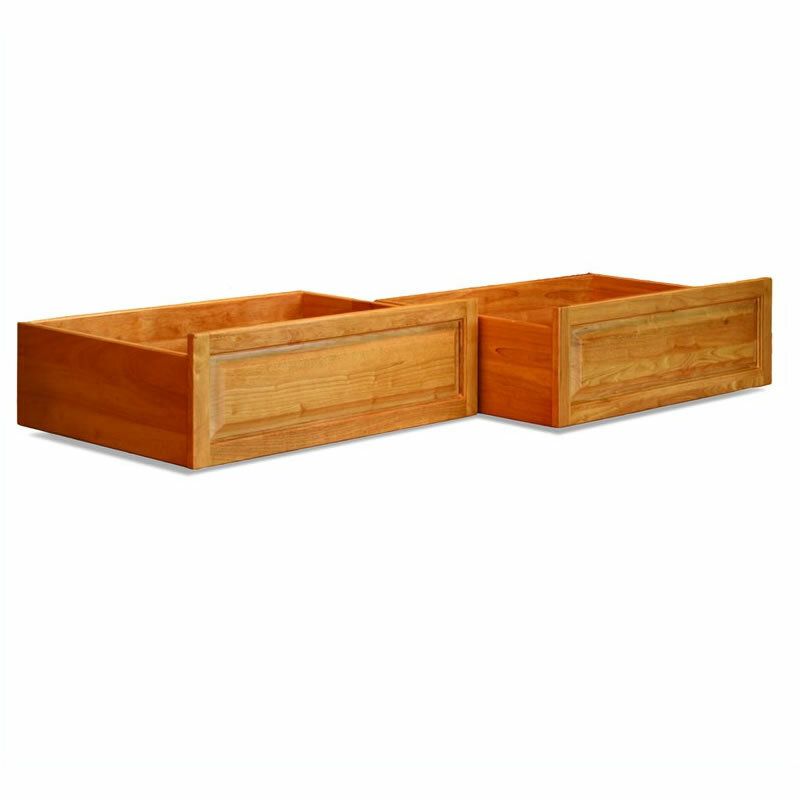 Drawers -- a large number of users heartily recommends getting the bed with the lower storage drawers. They are described as enormous, well constructed, and nice and big and deep -- plenty of space for extra bed linens, covers, maybe toys and whatnot. The drawers come on rollers and are just, well, rolled under the bed. There are no tracks, though, so they can look askew if the procedure is not performed carefully. There are also no handles -- some people see it as a drawback, while others praise this as a prudent safety measure -- handles might catch kids' clothing while they climb into bed. One has to really try in order to find a totally negative comment on this bed. In fact, we have yet to succeed on that. Mostly buyers who are complaining do so about missing screws or tools, wrong manual, wrong colored plugs, damaged pieces and such -- things easily fixable, if vexing to deal with. A (decisive) minority seem also to be unhappy about the quality: the bed squeaks with any movement, is how one customer put it. However, seeing how this directly contradicts with the large majority of opinions, it's possible that some subjective factors instigated these sentiments. In any case, such dissenting opinions are very rare. One other thing that you should consider is the mattress thickness for the top bed; in order to comply with the safety regulations, the top mattress shouldn't be more than 9 inches thick. Some reviewers designated this as a drawback, as they would have liked to use thicker, nicer quality mattresses. 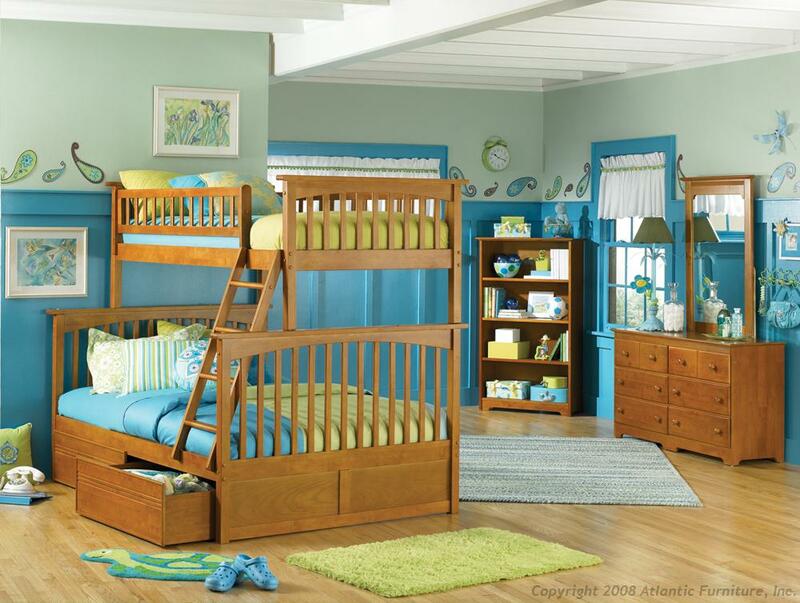 Great quality for the price -- seems to be the remark most often heard from the buyers of Atlantic Furniture Columbia line of bunk beds. When buying things online -- especially when buying something the size and cost of a bunk bed -- this is arguably the most important thing. You can judge the bed's attractiveness from the abundance of images available; its versatility and practicality from the available optional items, finishes and matching furniture. But when it comes to the quality of build and durability, pretty much the only thing you can rely on is the judgment of your peers.